Mom is Great! She Gives Us Breakfast Cake! This is a super easy breakfast that can be made ahead of time…or made fresh the morning you plan to eat it. 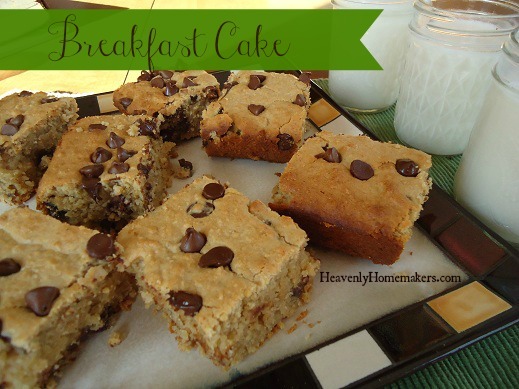 I adapted my Giant Breakfast Cookie recipe to make this cake, and it’s moist and yummy. Especially with a glass of milk! Stir in honey, eggs, salt, baking soda and vanilla. 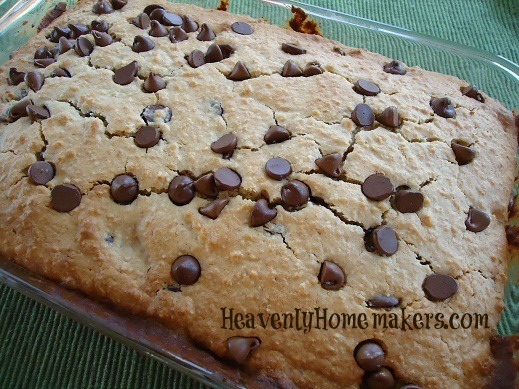 Fold in raisins, chocolate chips or dried fruit. Pour into a buttered 9×9 inch baking pan. Bake at 350 degrees for 30-40 minutes or until toothpick inserted in the middle comes out clean. Serve warm…serve cold…it’s good either way. Cut into squares and wrapped in plastic wrap, this is a great portable breakfast or snack too! Hehe…think we should tell ’em it’s good for them? Filed Under: Bread and Breakfast, Recipes, What's for breakfast? I’m looking forward to making this- sounds similar to my dutch puff recipe from Large Family Logistics. New to your site- enjoying it very much! Thanks! I’ve been making your breakfast cookies lately, chock full of dried berries and fresh fruit too. It is so yummy I am not sure I will switch to the cake:)Tomorrow I am having guests for breakfast and am making your Pumpkin Pancakes too. I have the flour soaking as we speak.Thaaaaank you! Sounds really good! In fact, I just started soaking my grains so that we can have this for breakfast tomorrow. Oh Yum! That sounds delicious. I immediately thought of Bill Cosby when I saw your link. We’re showing our age. :) Sounds yummy! Yea for breakfast cake! I’ve been looking for a good Christmas morning coffee cake. This sounds like something that might work perfectly! Thanks! Sounds yummy, I will have to try it. Thanks. I am always in the mood for cake of some sort. Have you tried it with cream cheese or any other frostings? Bet my kids will love it! Can’t wait to try it! Looks like Saturday’s breakfast is in the bag! Thanks for the recipe! Ooooh, we’re going to have to try this! “Bill Cosby Himself” – a must see for all parents! We laughed when we saw it before we had kids, and then found a whole new level of hilarity once we REALLY knew what he was talking about. But of course cake is good for breakfast – it has eggs and milk and flour, all of which are very healthy! My boys will love this! Thanks! This sounds great, quick question though. My son has a milk allergy. I have had some success substituting almond or rice milk for cow milk, and oil or Smart Balance for butter in some recipes. Can I subsitute something for buttermilk in this recipe and will it work soaking the grains in non-cow milk? Hoping I can find a way to make this dairy-free for my family! I have everything in my kitchen to make this. Unplugging my computer and I am on my way to make this N.O.W.! Hmmm, you are all about cake and cookies for breakfast, huh? My family is LOVING that about you! 1) this cake looks amazing and 2) I LOVE me some Bill Cosby. I wonder if my dentist ever tires of hearing “my libip id on da floobo.” LOL! That sounds delicious. Definitely going to try this. TFS!! Sounds yummy! I think I only have quick oats though. I’ll have to get the other kind. Can you tell me how many cookies the Giant cookies make? Thanks, they look like they will be very good. I can’t wait to try this. My kids love your breakfast cookie recipe! Sounds good. I think my kids are going to love this. Thanks! This sounds great! AND my dh’s 40th bday is tomorrow… guess what we’ll have?? AND AND it’s all natural! You win cyberhugs! Wow…thanks for the Bill Cosby throwback. My sister and I used to watch that special on HBO and laugh till we couldn’t breathe! Great recipe…I have a picky eater who has stumped me on breakfast lately. I am so glad I stopped by before going to bed. I was already planning on making the breakfast cookies in the morning, but now I am SO trying this instead. How fun and delicious. Hah! Sounds yummy! Do you serve it with grapefruit juice too? I did make it yesterday morning and it really was very good. We will have this again! Don’t use an 8×8 pan (instead of a 9×9 as specified) as I had trouble getting it cooked through. Thanks for the great recipe! I made this for my girls this morning and they LOVE it! I added some chopped peaches in addition to the raisins and substituted Agave nectar for the honey. Terrific recipe! I made this this morning and it was delicious–the kids were excited to have cake for breakfast. I had to cook it for 50 minutes, though. Don’t know why? i just printed this out to try! thanks! LOL…. I have to say I wondered that too! Glad I’m not alone on that one! Wow! I just tried this recipe this past weekend, and my family loved, loved it! It is now my 3 year-old’s favorite breakfast. Yes- we sing that song all the time when the topic of cake comes up. we’re having this tomorrow…can’t wait! I’m not exactly sure how I came across your blog, but I’m glad I found it! I hopped around the blog and found this recipe because of the Cosby reference. We had this for breakfast this morning and it was delicious! I can’t wait to try some of your other traditional recipes. Just wondering if this could be adapted to use up leftover oatmeal – I have a few cups in the fridge I would love to do something fun with….what do you think?? This sounds lovely! I have been adapting buttermilk recipes lately to make them non-dairy using juice kefir. It works great! Just thought I would share that for any non-dairy folks out there who need a new idea! Replace the butter with an equal amount of applesauce. You will cut the fat right out of your recipe. Seriously – I use applesauce in place of butter in my brownies, cupcakes, regular cakes, ect. Do you happen to know the calorie count on this? I would LOVE to try alot of your recipes but I’m on a diet and need to know the nutritional info. I’m definitely using this for a future breakfast. I’m seriously going to try this; I get so sick of serving up the same ol’ stuff for breakfast all the time. And hubs really needs something portable. I am so excited! I have everything I need in my kitchen. It’s 11:00 AM right now so I’m planning to the oats today and bake it tonight so it will be ready to eat first thing in the morning when my husband leaves for work. Do you think this would freeze well? I think I may double the recipe and freeze it just to see. Yes, it will do just fine in the freezer! I made this for company a couple of weeks ago, and I forgot to add the honey. Fortunately, I used chocolate chips and it was sweet enough with them. It was a little dry though. I just made this this morning for my incredibly picky eaters (ages 2 and 4). HUGE hit-thank you! Your blog is so helpful! Ok I just realized that one stick of butter (1/2 cup) has 88 grams of fat!!!! Is there a lower fat way to make it? I’m not into low fat foods by any means but butter does contain high amounts of saturated fat which is proven to be unhealthy for your heart. You can substitute applesauce if you want and I think it should work just fine! I second Suzy’s reply. My family has taken the same approach to fats this entire year and we have all actually lost weight as well and have been much healthier and felt much better. We are not afraid of butter, cream, and whole milk around this house! To me these are a few of life’s God-given pleasures!! what type of butter are u guys using..cause ive working on getting rid of my country crock for that reason :( I love my margrine but I know to be healthier like im trying to do i need to x it out and use real butter..someone pls tell me the best butter to use..thats real.. The only butter I’ve been able to find in stores that isn’t loaded with fake ingredients is Land O’ Lakes all natural. Be careful though, because some of the Land O’ Lakes brand stuff is not butter. The Land O’ Lakes all natural brand I found listed only whipped sweet cream and salt as ingredients. Kerrygold butter is the best. We bought ours from Costco. Third That! Add Nourishing Traditions to your recipe book collection. It totally opened my eyes. Now, that doesn’t mean slather it on every bite of food, but when fat is called for, make his your choice. I use organic butter made by the Amish, yum! I no longer use vegetable oil, corn oil, canola oil etc. I have been so torn as to what is the best oil to use. so I ended up using olive because that is what we had on hand. I’ve heard that the very best butter to use is actually cultured butter. However it is hard to find and quite costly when you do. Think $5 for a pound! Coconut oil is a great stand in also. When I contacted the Weston Price Foundation about getting butter and cream from the store. They responded that the only dairy products that they would suggest buying at the supermarket (pasteurized and such) are butter and cream because they are a different part of the milk. So we buy milk (and cream) from good old Wally World and we get our milk from a dairy raw. less baking time. Getchu some coconut oil! It’s kind of expensive unless you buy it at Walmart. the protein to which they are attached. French and Japanese have lowest case of Coronary disease! Amish butter, but would get that at Walmart also if I had to. here. So I can use butter or applesauce. . . or coconut oil. I’m going to see if I can get it at our Wal Mart. We are working on being healthy eaters but it is so expensive here. and it’s in a hard plastic plastic cylinder tub. But yes, butte and applesauce would be cheaper! I use coconut oil for everything these days. Super yummy and you don’t get the coconut flavor in everything, it just gives it a light flavor, really nice. Amazon has organice on their subscription. I read last week- on a blog that the coconut oil from Walmart is not expelled the same and therefore has transfats in it. Laura, do you know if this is true? Cake is a favourite food group of mine, so I was excited to try your recipe. Half asleep I assembled the goods to soak and added the honey by mistake, but it worked out fine in the morning. I added raisins and cut up some dates. The cake was very lovely, my husband and our two year-old enjoyed it as well! Thank you for the recipe. No, whole wheat is best soaked no matter if it is fresh or store bought. BUT, I don’t always soak – I just TRY to soak. The recipe will work either way. Thank you! Can’t wait to try this with my boys! I have quick rolled oats that I bought for another recipe. Is this the same thing and do they need to be soaked overnight? Quick rolled oats are the same as rolled oats, except that they have been processed just a bit more so they are a little more “chopped up”. They will work just fine in this recipe and if possible, I do suggest soaking them for this recipe! Can you use steel cut oats for this? I never have but you could try it! – YUM, YUM, YUM! This is how I eat them normally as well as cooking. I just sat down after making a bunch of pizza pockets to freeze for lunches and found this recipe. Looks great and will have to add it to my other from your wonderful site. Now I can’t stop singing that Cosby jingle in my head! Thanks Laura! This sounds awesome! Just baked a batch of the breakfast cookies and all 4 of my boys were head over heels in love with them! I was thinking about adding some organic baking cocoa to this recipe for an over-the-top breakfast cake. Will let you know how it turns out! I 9×13 might work, but it would take a lot of baking time. You may want to try pouring it into a baking sheet and baking it like a sheet cake. I think you can just soak the oats by themselves since the wheat was sprouted. No need for soaking the flour! Just add it after the oats are soaked when you’re ready to mix together the rest of the cake. Thanks for the reply. Would you believe I JUST finished mixing it all in a bowl to soak for the night? Shoulda checked my email first! Oh well. I doubt it will hurt to soak the flour too, even if it didn’t need it. Looking forward to cake in the morning! I wouldn’t think it would hurt the sprouted flour to soak it, and from what I understand, you need to add some flour to oats when soaking them anyway. The oats themself don’t have enough phytase to break down the phytates in the oats, so the flour provides the phytase needed. I’ve made your Giant Breakfast Cookies several times now and my family loves them, so I decided to try your cake recipe. My cake came out rather dry compared to the cookies. Any suggestions? I’m not sure…my breakfast cake is usually quite moist. Maybe try adding a little more buttermilk next time? Just a guess. Can’t wait to try this! You say to bake it in a 9 x 9 baking pan. I only have an 8 x 8 or 9 x 13. Would it work ok with one of those sizes. Silly question I know! I’d say go with a 9×13 or it may take forever to get done in the middle! Great recipe and can’t wait to try this! I’ve never soaked grains before and have an issue with leaving something with buttermilk in it on the counter overnight. Does the milk go sour at room temp for that long? Can you soak in the fridge? Thanks! No, it does just fine at room temp overnight. Buttermilk is already “soured milk” and has live cultures in it, making it very safe to be left out overnight. If you soak in the fridge, it will be REALLY difficult to stir the next morning! How crucial is it that your bowl is glass? I don’t have a glass bowl anymore (I regretfully gave it away over a year ago). Would a metal bowl work??? Soaking grains requires an acid (in this case, the buttermilk), and acids and metals don’t mix… In truth, you would be causing metals to leach out into your food. I would invest in some glass for soaking– I had to do this when we started soaking grains, too, and it has been worth the money. I actually just bought a glass salad serving bowl (for its size) and it works great, plus it was cheaper than the actual mixing bowls atthe store. Thanks! That’s what I needed to know! Do you mill your wheat in the “Fine” position for cakes, pies, cookies etc. or still in the middle at 12 o’clock? We just had this cake. We loved it. I didn’t have any dried fruit so I put frozen blueberries in it. They all ended up at the bottom, but it was still really good. Everyone loved it. Mine was crumbly and didn’t look as pretty as yours. I forgot to adjust for my high altitude next time I will add more flour or less soda. Ok, I noticed after I soaked the oatmeal and wheat that it was very hard….after I added rest of the ingredients it was a little more moist, but I’m afraid it’s going to be dry too…. I followed the directions exactly…. Hope they like it enough to eat it if it is dry. (I also used the homemade choc chip recipe.) :) But I’ll try more buttermilk next time, if it is too dry. Thanks for a great idea! My family loves this cake and the breakfast cookies, too. But my youngest can’t eat it because of a number of allergies. I can easily sub for the dairy and chocolate chips that I usually use, but I’m stumped on how to sub for oatmeal. Do you think I could just use more flour? I’m afraid it will be too dense and no one will want to eat it. Any suggestions? Hmmm…maybe sub other items like coconut flakes, sesame seeds, flax seeds – things that would take up some of the “space” in the recipe without weighing it down so much. Just an idea! I tried it this morning. I subbed coconut oil for the butter, rice milk for the buttermilk, shredded coconut for the oatmeal, and I used raisins. It was still pretty good. The child who couldn’t eat it before gobbled it up! The others gave mixed reviews. They said they like it the original way better. :) Personally, I just missed the chocolate chips but thought the cake part was fine. Thanks for the recipe and for the substitution suggestion. Just brings back funny memories. We had this for breakfast today. It is AWESOME!!! Laura, I buy all my diary products from the grocery store so of course they are pasturized and homogenized. Can I still leave my grains soaking out on the counter overnight? I think you’d still be fine – I’m assuming you’re meaning that you’ll be making cultured buttermilk with these dairy products and then using them to soak your dough? If so, then yes, I don’t think you have anything to worry about! Hey, I haven’t tried soaking yet, but I can’t afford and don’t have time to make my own buttermilk, so I buy it from the store – does that mean I cannot do soaking?? Well, I soaked and made this… And had horrible horrible gas all day from eating it… I’m wondering if the soaking was actually a problem. :( I’m going to try again eventually and not soak this time and see if I can eat it. It was so yummy, but I can’t have my insides tornup like that! I LOVE your website. And when I say love I mean I REALLY LOVE your website. Finding this recipe had me (almost) rolling on the floor in a fit of laughter. My husband and I love that Bill Cosby comedy sketch. We actually just watched it on youtube about a week ago and started singing it to our 7 yr old. Now he sings it all the time. I have lots of questions for you but I need to get to church tonight. I will try sending you an email later when I get home. Thank you for all your wonderful advice and patience with those of us trying to eat healthier and feed our families healthier too. God bless you and your precious family! I use fresh goat’s milk to soak the grains when I make this cake and your waffles too. The thing I’m wondering about is the comment about the acid needed in buttermilk to break down the flour. Would the fresh goat’s milk be doing that? Wow! That is a big calorie saver! What great substitutes. Laura let me nkow that the acid is something that is needed and the goats milk does not do it alone. I would recommend baking in a 9 x 13 pan vs 9 x 9. I baked mine in an 8 x 8 and it took almost an hour of baking, the edges were burnt and the middle is still rather moist. Otherwise, good recipe. I used yogurt instead of buttermilk for the soaking. I was so excited about this! It is in the oven now…and has been for a really long time. It is still VERY jiggly in the middle and DARK brown. IT looks nothing like yours…what in the world have I done wrong?? Every oven is different, so it sounds like you may need to set your oven at a slightly lower temp and/or maybe bake it in a larger pan so that the dough can be more spread out. Hope that helps! I made this for Sunday breakfast today. It turned out perfect. In a 9 x 9 pan, it baked for about 50 minutes in my oven. My family couldn’t decide which was better…giant breakfast cookies or breakfast cake. Both are winners at our house! This cake is soooooo…… good. I am wondering now though if and how one could make this gluten free. Could anyone help me with what would subs would work to make it gluten free? that are naturally gluten free. You could try to sub something like that. I think it was Red Mill brand. YUM! I made this recipe tonight – as muffins. I like the simplicity of serving and the ability to freeze some! I didn’t have any buttermilk, so I substituted vanilla yogurt with good results. I just mixed the ingredients that are to be soaked, and it’s all very dry. I assumed it would be very liquidy. Is it supposed to be so thick and dry? I only used 3/4 cup buttermilk. Is that wrong? No, you did it fine – not all recipes that call for soaking are very liquidy. I mixed my buttermilk and butter with the oatmeal and flour. It is a really thick mixture like the texture of hard thick oatmeal. Is this the righ consistency ? I am worried. That is the correct consistency, but since it does get very thick, I sometimes use my food processor to help me mix in the remaining ingredients. What can you use instead of buttermilk? I do not have a health food store close to me and finding whole foods is a huge challenge, along with my very limited budget of $75 per week (for a family of 5, 3 teens). I do use soy milk, would that work. Thanks Just found your site and I love it. have you made this with coconut flour instead of wheat flour? if so how do I substitute it? or would almond flour work? I had a question about some of your recipes. I was wondering if I can add pumpkin to this and the giant breakfast cookie recipe? Also, I only have whole wheat pastry flour, can I use that instead of whole wheat flour? Is it the same thing? Both of those should work. You shouldn’t need to do anything else to add pumpkin. I do not think that whole wheat is the same as whole wheat pastry, but it should be fine. Hi I wanted to make these today but I don’t have buttermilk and don’t have transportation to the store since we only have one car. So I was wondering what can I substitute for buttermilk??? Any ideas?? Regular milk will work just fine! Do you think you could bake this recipe in loaf pans? Is there a reason that the cookies call for cinnamon, but the cake does not? I’m eager to try this!! I have made this recipe in the past and wasn’t to keen on the results. When I used the 8×8 pan it was dry, very crumbly and in order for the center to be cooked through the outer edges were way over done. I changed and put the batter into 9×13. Better results but still a bit dry and crumbly. This time I did things differently. I did not soak the flour and oats. I put my oats and flour in the food processor and blended them together and made the oats into a flour.I used Bob’s Red Mill extra thick rolled oats and King Arthur’s White Whole Wheat flour. I added the other ingredients into processor, except chocolate chips, and blended them together (I folded in the chocolate chips last). Instead of a pan, I made muffins. It took about 15 minutes at 350 to bake these and they were light with a nice crumb and not overdone at all. These were delicious and came out of the baking cups very easy. My kids enjoyed them very much! Could this recipe be made with regular flour instead of whole wheat flour? If so, should I still soak it with the oats? Love Butter, cream & all.. I rarely use crisco or veggie oils. would rather use lard & olive oil. I made your breakfast muffin recipe too. in fact in this recipe I used 1/2 cup butter & 1/2 cup coconut oil. & my own yogurt in place of the buttermilk. I put a brown sugar , butter oatmeal topping on them before baking . Thanks SO much for posting. my mom is 87 & rarely eats like she should , so I am taking a couple to her in the nursing home today. I love this cake! Mine comes out very dense and looks nothing like yours. I do soak it. So full of yummy goodness! What does soaking just the oats do for the recipe and does it matter what type of oats? Soaking the oats makes it more digestable. I am not sure if it would make a difference if you used different oats. Usually substituting something else is not a problem. Have you tried this overnight in the slow cooker? I’m thinking this would be nice to wake up to for breakfast on Sunday mornings. I guess, though, if I can’t cook it that way, I could always make it into muffins and freeze according to your super tip earlier this week….Any tips about the slow cooker would be appreciated! Thanks again! I’ve made this recipe regularly at my house. I made a few adjustments to fit my food goals. I use skim milk instead of buttermilk and greek yogurt instead of butter. Doing so added some protein and reduced the fat without having to give up the moist texture. I only use egg whites as well. I still soak it overnight in my fridge. Set it on the counter when I wake up and let it warm to room temperature. I put the batter and the rest of the ingredients in my blender to finish the batter and bake it, and everyone loves chocolate chip cake for breakfast. It fits my trim and healthy mama eating plan as an E meal just barely. I only have raw milk on hand and don’t want to have to buy buttermilk just for the soaking. Can I add something to the raw milk to make it acidic? Like apple cider vinegar? If so, how much vinegar should I add? And is it still ok to leave it out on the counter since it’s not buttermilk? You can make your own buttermilk by putting a tablespoon of vinegar (distilled white) in a measuring cup and then filling up to the cup mark with milk. Let it sit a few minutes and you have got buttermilk! I am curious. I read another link that said you are no longer soaking your grains. I don’t soak – could I just make this without soaking? Any other changes? Thanks! Yes, go right ahead and mix this up without soaking. It will be just fine! Are you using fresh ground wheat? If so, what kind? I have hard white, soft white, and einkorn. Also, if you grind, do you sift afterwards to get the larger, harder bits out? Yes, any of those grains would work fine in this recipe. I typically use hard white, and I never sift. My Nutrimill makes the flour very fine. This cake is also delicious made adding vanilla & topping it with a cinnamon streusel topping. It’s more crumbly, but I make it dairy & wheat free for our son who has allergies. I use unsweetened coconut milk with a little vinegar & grind two cups of oats in the blender into oat flour instead of using wheat flour. I love how versatile your recipes are, Laura! Is this too big recipe to put in 8×8 pan? I don’t have 9×9. Or should I put in 9x 12 casserole dish? just put a muffin recipe in a 9×13 pan. savory muffins are best as you dont want much sugar in a meal replacement. cheese, bacon, ham, chopped broccoli, onion, mushrooms. even chopped sautéed greens. so much easier than muffins or cookies. i hate spooning out batches of cookies or washing muffin tins.